Seeing as how I won those single coil pups during ElectraFest '11 I have been thinking about what to do with them. Who cares how they'd sound? No one would listen because they'd be too busy looking at your fine body. That didn't come out right. I meant .... your fine piece of black ash - Oh!! I meant Limba. Nevermind. 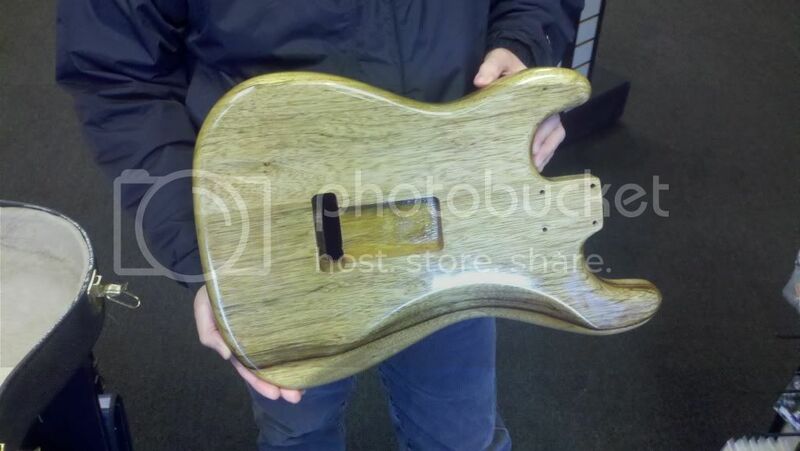 Great looking chunk o wood there - what were those pickups again? To be honest jead I cannot remember what they were described as. I think McBrat donated them (???) and they are white with slotted screw poles. No markings to speak of on the pups themselves. 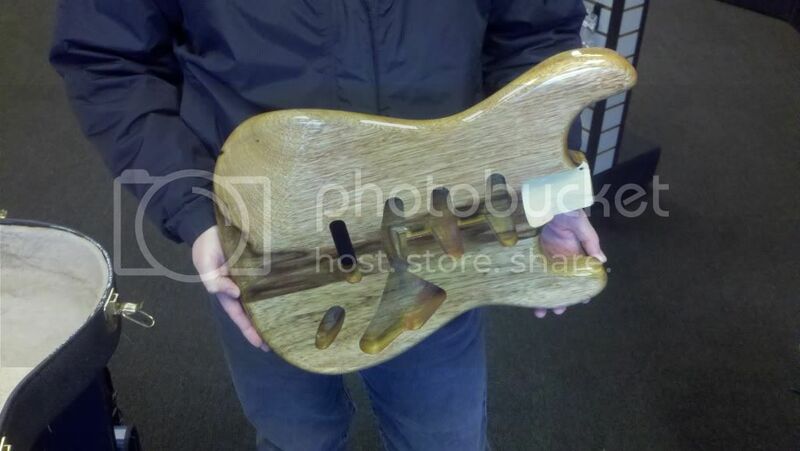 I am still looking for a good piece of wood for the super strat p/u's I received in the Efest drawing. Good luck on your project. Well yyz, I haven't decided for certain yet if I will buy this one. What are your opinion guys on how much a piece of korina like this should cost? It is finished obviously but still needs to undergo buffing to even out the shell and remove some remaining lacquer drips and buildup. I'd say that ought to be right around $200. Maybe a little higher. Oh man, that is one gorgeous piece of wood. Ooooh, that's pretty..... I can see no reason at all that would impede your purchase of that piece of timber, other than lack of funds!! Yeah, unfortunately I have had communications with this seller over the xa1530 he has had up for 6+ months or so and that exchange has soured him to be beyond repair. The guy has no idea how to compromise in dealmaking. It is really too bad as he is a very manageable driving distance for me just south and somewhat west of Minneapolis by a couple hours tops. Just my experience and opinion but I personally steer clear of this seller. Like someone said - "that is one gorgeous piece of wood". Keep us posted with future build progress. Not problem at all RCS, copy away. I next need to be sure of the neck dimensions for OAL, 12th fret distance & so forth to insure proper intonation, correct? A bud over at Westone is trying to rebuild his Spectrum body with an aftermarket neck he picked up and is having spacing / tremelo issues galore. Do not need those sorts of headaches. You should be dealing with a 25 -1/2" scale on virtually every strat body. A phoenix neck should fit perfectly for scale length. The width should also drop right in or be very,very close. The bolt pattern is immaterial as you should fill any holes on a used neck anyway. I love these things - they've solved more than 1 neck problem for me. Thanks jead, I will look into those as well. I already was thinking along the lines of inserting machine screw receivers into the mix. The bolting strength would be increased and my hope is that it would improve sustain. I do like the feel of a Phoenix or Spectrum the only decision is on the headstock style. To me older seems better. I have a couple of vintage Squier necks in mind as well. I never got into mismatched styles (Fender style headstock on Gibsons, etc.). The only brand that seemed to make that work was the early B.C. Rich models with the R logo like the Mockingbird. "Open books" worked there to my eye. Not sure if a Spectrum II neck would seem right on that body, but an 83 Phoenix might. At the pain of committing heresy I will ask... refinish the front of the headstock or leave the logo intact if I do go Electra?